The ridgeline is taking awhile, and it is now 5am and I should get some rest. I have to be up at 12 for an appointment at 1pm. I am thinking I need to cap the top off cleanly or it will look bad on the table. No stove for these guys, I may add one later on but for now priority is to get this done and painted for next weekends game. Ridges being placed and glued. This was a challenging part of the project, I thought it would take me a short while. No luck of that happening. That's going to be a seriously impressive piece of terrain when it's finished. Thanks Matt. 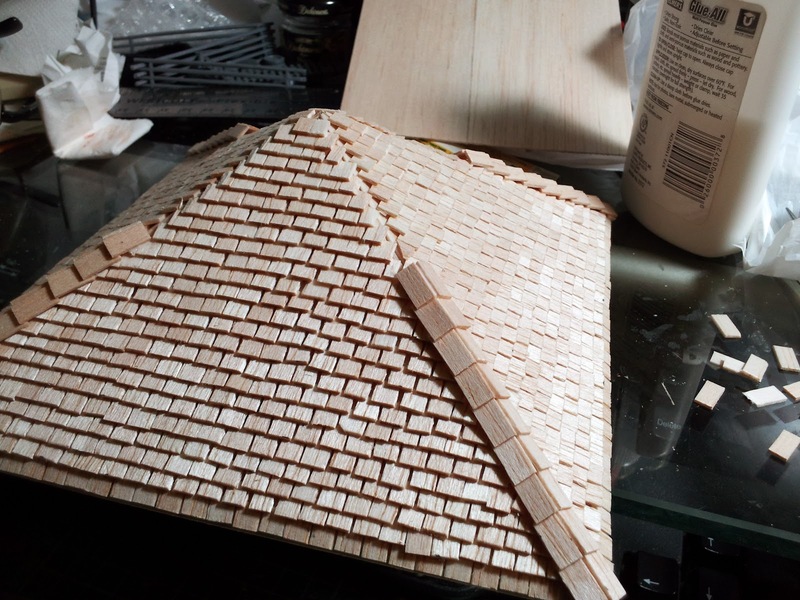 The roof is actually done, just filling gaps and waiting for it to dry. I will start on the door and then paint paint paint. At first I thought it wasn't going to take that long, but day after day working on it the time kept on adding up. As it stands I probable spent a good portion of 48 hours worth of work on it. That really looks good. Mightily impressed. I certainly look forward to the finished item pictures.